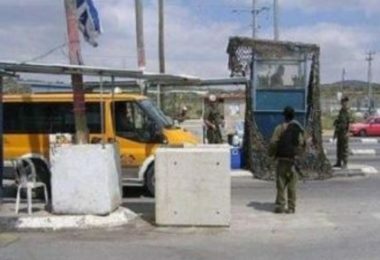 Israeli soldiers abducted, on Wednesday at dawn, a young Palestinian man in Qalqilia city, in northern West Bank, and installed a roadblock at the eastern entrance of Azzoun town, east of the city. Media sources in Qalqilia said the soldiers abducted Ismael Jibril, from his home in Kafr Saba neighborhood, after storming his property and searching it. They added that the soldiers also invaded and searched a home, owned by members of Hmeid family in the city. The soldiers also installed a military roadblock at the eastern entrance of Azzoun town, before stopping and searching dozens of cars, causing a traffic jam. In addition, undercover forces infiltrated into the town while driving a car with Palestinian license plates, and withdrew once they were noticed. Furthermore, the soldiers abducted eight young Palestinian men from their homes in the al-‘Isawiya town, in occupied East Jerusalem.